Peak functionality … but physical well-being is only one of four types employers should consider. The answer, of course, is yes. A workforce that is “well” leads to increased productivity. But research has uncovered a startling disconnect between employer and employee perceptions of workforce well-being. More than half of employers (56%) believe their well-being programs have encouraged employees to live healthier lifestyles, but less than one in three employees (32%) agrees, according to our Global Benefits Attitudes Survey. We looked at the Net Promoter Score (a widely used index of customer satisfaction ranging from -100 to 100) to assess the likelihood that employees would recommend their employers' health and well-being initiatives and activities to their colleagues. In every country except India, the detractors outweighed the promoters, typically by substantial margins. 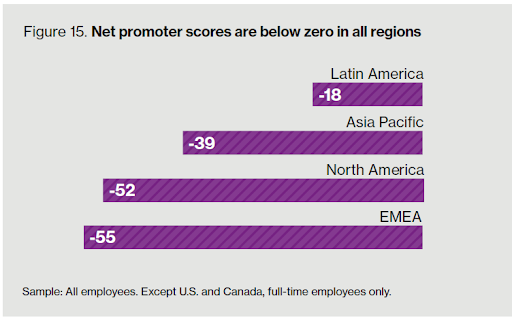 Clearly, employer well-being programs to date are missing the mark for employees, particularly in North America, Europe, the Middle East and Africa (EMEA). Why do well-being programs fail to resonate in the workplace? Employees are looking for more than financial incentives when it comes to participating in employer-sponsored health screenings or savings vehicles. Instead, they want to feel these types of programs and tools meet their needs as individuals and connect to them in a deeper, more meaningful way. We believe an integrated approach that encompasses four dimensions of employee well-being – physical, financial, emotional and social – is the key to creating greater employee engagement. 1. Physical well-being: To thrive physically means understanding and managing one’s health, taking appropriate preventive measures, improving health status where needed, managing chronic conditions, navigating and recovering from an acute illness or unexpected injury, and successfully returning to peak functionality at home and at work. 2. Emotional well-being: Being emotionally balanced means being self-aware, maintaining good mental health, being resilient by managing stress, coping with positive and negative emotional triggers, dealing with life crises and maintaining stability through illness or injury. 3. Financial well-being: Achieving the state of being financially secure means having the ability to manage budgetary commitments, meet financial goals, protect against risks, save for contingencies or future needs like college or retirement and cope with financial shocks. 4. Social well-being: Social well-being is about being connected by understanding how to interact well with others, accepting diversity, being inclusive, knowing how to support and collaborate with others, being able to successfully resolve conflicts and adapting to change. Being connected applies across one’s family and friends, one’s workplace and the larger community. Each dimension is unique and intertwined with the others. Integrated well-being begins with individuals and, when achieved, extends throughout their organizations, families and the larger community. As a result, the ideal state of well-being ⎯ physically thriving, emotionally balanced, financially secure and socially connected ⎯ places the employee at the center and is truly integrated across all four dimensions. How do you connect these four dimensions for employees? Through our extensive interactions with employers, we’ve found that they truly believe that employee well-being is important and will indeed improve financial results as well as talent retention. As with other areas of total rewards, such as benefits, they are making the shift toward being less paternalistic. We see more customization being offered: for example, a defined contribution approach (as opposed to a defined benefit prescribed by the employer), in which employees can choose from a menu of well-being programs that make sense for them, much as they do with health or retirement plans. 1. Assess where your company is currently in terms of addressing each of the four dimensions of well-being defined above. Consider both the employee perspective as well as your leadership’s point of view. For example, when it comes to physical well-being, your company may integrate workplace safety and well-being strategy and programs, but may not be delivering programs or pilots that target specific conditions or high-cost cases that employees are looking for. 2. Set goals and objectives to help close the gaps identified in your assessment and develop guiding principles for design and prioritization of your strategy. For example, you may want to set and track specific metrics for financial well-being programs at pivotal financial decision points and then offer one-on-one counseling at employees’ critical junctures if you find these programs are being underutilized. 3. Design your well-being program. Consider decision support and educational tools across each of the key dimensions. For example, for emotional well-being programs, consider decision support tools to help employees find the right behavioral health provider or treatment facilities. 4. Consider vendor solutions and software tools to implement programs you determine are needed across each dimension. For example, diet and exercise tracking for physical; retirement counseling sessions for financial; employee assistance programs for emotional; eLearning platforms to promote positive workplace culture and diversity initiatives for social. 5. Implement processes for managing vendors and tracking progress. For example, require vendors to share data for employee referrals and integrated reporting. Use single sign-on technology to enable employees to easily access various vendors through one benefits portal. 6. Engage employees through campaigns, training, ongoing communications and the rollout of individualized solutions. For example, use social recognition such as designating local champions for community initiatives, and your company intranet to promote photos and stories of employee participation in activities. The graphic below illustrates a number of other ways to consider the various components of employee well-being as part of an integrated strategy. An integrated approach to well-being means moving away from buzzwords and gestures to finding solutions that can meet employees where they are. It means creating a culture that supports and respects employees as individuals (e.g., inclusion and diversity, community involvement, corporate social responsibility, etc.) And it means planning for the lifespan of your employees, not just the next year. Over time, their needs will change, so you need to design programs that will evolve as they do. Well-being matters; how your employees feel influences how and where they work. It also influences productivity and ultimately financial results. Moreover, having employees who are thriving, secure, balanced and connected can not only help to improve the workforce, but also the world as we know it.